Join us Feb 2019 as we collaboratively read and annotate Doug's 1962 Framework Visit framework.thoughtvectors.net for details. This was the final report of a groundbreaking study conducted by Doug Engelbart at Stanford Research Institute (SRI) to flesh out his ideas for making the world a much better place in the fastest possible timeframe. 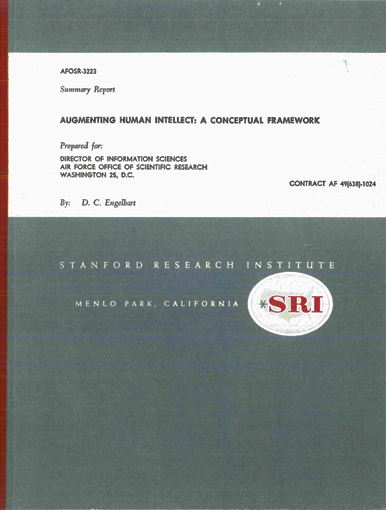 In the course of this study, funded by the Air Force Office of Scientific Research (AFOSR), Doug forged a new discipline he called Augmenting the Human Intellect, with in-depth conceptual framework, research agenda, and strategic approach for bootstrapping the results at scale. This report summarizes his findings and recommendations. R&D funding ensued, and so the Augmenting Human Intellect Research Center (AHIRC) was born. In a few short years, Doug and his team forged a constellation of breakthrough firsts to herald in a new era in human effectiveness, as demonstrated first in 1968 in what is now known as the Mother of All Demos, again in 1969 with the 'sequel' to the Demo, and beyond. Technological firsts included interactive,collaborative, hyperlinked, networked personal computing, which he co-evolved alongside organizational innovations that were just as profound. And for his efforts he was recognized with the National Medal of Technology & Innovation, the Turing Award, the Lemelson-MIT Prize, an Honorary Doctorate from Yale, and more, even as he continued pointing to the future through his management seminars at Stanford University, lectures, alliances, and more. In other words, Doug's conceptual framework for augmenting the human intellect drove one of the more revolutionary research agendas on record, and, like Einstein's Theory of Relativity, is still enormously relevant. And yet we still have barely scratched the surface of fully appreciating, let along achieving, its true potential. And all of this traces back to this one seminal document -- the strategic thinking, big picture vision, phenomenal thought experiments, unifying conceptual framework, organizing principles, approach, and application scenarios -- which informed and shaped all subsequent work. Browsable with our usual enhanced navigation and associative trails features, such as floating Table of Contents and Purple Numbers (see About Our Website), with more formats offered through the Doug Engelbart Texts Archive at the Internet Archive, all hotlinked below. For the full citation, refer to #3 in Doug's Bibliography. • Computer Supported Cooperative Work: A Book of Readings (1988). Summary of Proposed Research: A Program in Human Effectiveness, 1961, by Douglas C. Engelbart (the version he sent to Vannevary Bush); more at Stanford's MouseSite Archive: Engelbart Papers.